Scientists with NASA's New Horizons program stumbled upon something that surprised them while taking a look at the latest data. Scientists are surprised after finding a smooth, round region on the surface of the planet — and the reason why they can’t believe what they’re seeing has to do with the planet’s age. This region on the surface of the former 9th planet in our solar system is no more than 10 million years old, which would be extremely young for a solar system that has been around for 4.5 billion years, according to a Christian Science Monitor report. This region can be found in the large western uppermost “lobe” of the famous “heart” shape on Pluto, which has been named the Sputnik Planum. As you can see with your own eyes by looking at the photo, there just aren’t any craters there, indicating that there is some geological process at work that is causing the surface to be smooth. Why is this so surprising? Because it means Pluto would have to have some source of heat, which is hard for scientists to believe on a small cosmic body like Pluto, which is even smaller than our moon. It could change the way scientists think about such proto-planetary bodies, and contradict assumptions that dwarf planets can’t have active cores so long after they were formed. 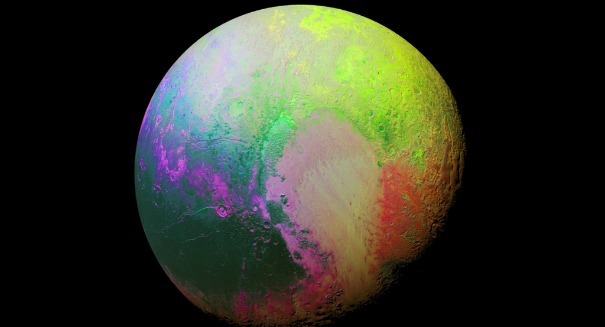 NASA’s New Horizons team just keeps on finding more and more about Pluto ever since its flyby a few months back. The space probe is slowly sending back data ever since its left the solar system and headed for another cosmic body in the Kuiper Belt, so more discoveries will probably trickle in over the coming months, or perhaps even years. Scientists typically use craters to determine how old the surface of a planetary body is, with more craters indicating an older surface. But palnets that have glaciers, volanoes, and wind storms can smooth those craters over. The new findings indicate that there isn’t even one crater on the Sputnik Planum, indicating that it is no more than 10 million years old.